Make lunch exciting with these golden-brown sandwich twists stuffed with salty deli ham and nutty Swiss cheese. Pack in a lunch or picnic box along with a squeeze bottle of your favourite mustard, an apple and a thermos of hot cider for a delicious, filling and far-from-ordinary meal. Divide the dough into 6 equal pieces. Cover 5 pieces with a tea towel. Divide the 6th piece of dough into two equal pieces and flatten the two pieces into 6 to 8 inch long rectangles. Tear or cut two slices of Swiss cheese into strips. Arrange half of the cheese strips down the long edge of one rectangle and repeat with the remaining cheese and other rectangle. Stack 2 pieces of ham and roll up into a tight tube, lay that on top of the cheese on on rectangle then repeat with 2 more pieces of ham and the other rectangle. Wrap the dough around the ham and cheese, taking care to pinch the ends and seams tightly to seal. Squeeze the ends of the two tubes together and then twist them around each other, pinching the opposite ends together when you reach them. 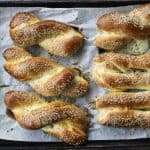 Let the sandwich twists rise in a warm, draft-free place covered gently with a tea towel, until puffy, about 30 minutes. Carefully remove the tea towel from the twists, brush them with the beaten egg and sprinkle about 2 teaspoons of sesame seeds each one. Bake for 18-24 minutes, or until a beautiful brown. Remove from the oven and let cool on the tray for 10 minutes. Eat while warm or transfer to a wire rack to finish cooling before wrapping in foil or parchment and refrigerating or freezing. Place foil or parchment wrapped sandwich twist in a preheated 350°F oven for 15-20 minutes, or until heated through. Place foil or parchment wrapped sandwich twist in a preheated 350°F oven for 30-40 minutes, or until heated through.